The Pirin Folk Ensemble gave a gala concert at Sofia's National Palace of Culture to mark the 70th birthday of its chief artistic director, Prof. Kiril Stefanov, and the Ensemble's own 50th anniversary. 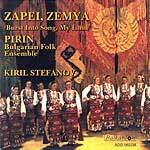 The Pirin Ensemble was established in 1954. A professional artistic formation, spreading the beauty and charm of Bulgarian folklore heritage and expressiveness around all world continents - Europe, North and South America, Africa, Asia, Australia. The Ensemble has performed in 60 countries, with more than 6,500 concerts and attendance of 6,000,000 visitors. It has also produced many audio tapes, video films, and CDs. Over 60 different types of refined national costumes, are worn by its artistic groups. Pirin is an ensemble, representing the musical and dancing folklore of the Southwest Bulgarian ethnic regions, and the whole of Bulgarian ethnic community, on stage. Comprising three major artistic units - a women's a cappella choir with soloists, a dancing group, and a folklore orchestra, its programs combine authentic folklore samples with author's songs and dances on a folklore basis. The Ensemble enriches its repertoire by choir performances of Bulgarian Orthodox music. It accomplishes research and registration activities, and brings old authentic folklore samples back to life on stage. Chief artistic director and conductor of the Pirin Ensemble is prof. Kiril Stefanov.